Forward cabin, with double bed, twin wardrobe, table and several cupboards and locker. Adjacent guest twin cabin with two single beds one above other, wardrobe and table locker. 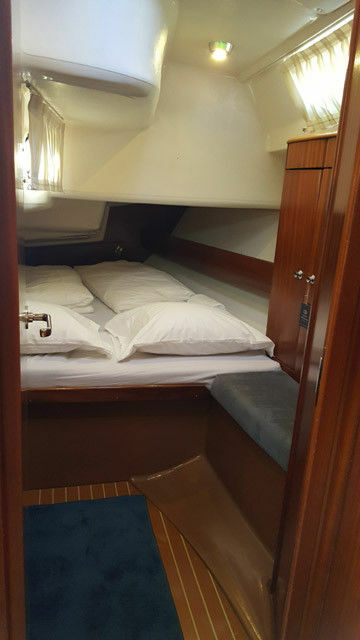 Aft starboard and portside are identhycal double bed cabins with wardrobes and seats. Saloon, on the starboard side there is alcantara sofa (there is an extra new cover as a spare) could be used as auxiliary bed. 8 persons could be seated. The Saloon also has dining table in the middle, upper full length cupboards and under the seat storage space, TV and sound system. 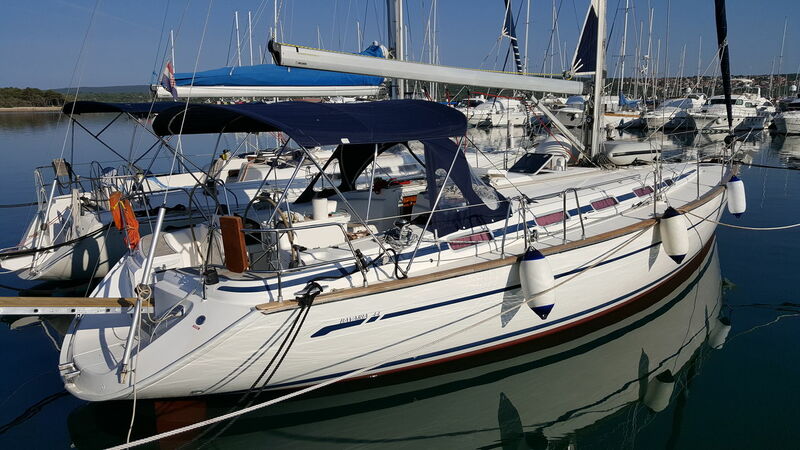 On portside there is fully fitted galley with hot and cold water, 1 ½ sinks, hob, oven, and fridge. All cups, saucers, plates, pots, kitchenware for 9 persons are provided. 1st WC with marine toilet pump, washbasin, mirror, and storage all clean and functional. 2nd WC with marine toilet pump, pull out shower, washbasin, mirror, and storage. This WC has a waste water tank. Volvo Penta D2 55 has 2300 Hrs. Oil pressure and piston compression checked all in order. Engine fires and run smoothly. Average consumption is (depending on RPM) is about 3 l/hr @1800 RPM, speed 7kt. You will also be given tuition and understanding on all the equipment and systems on the boat and tuition in handling the boat which is included in the price. All original instructions and manuals are onboard.